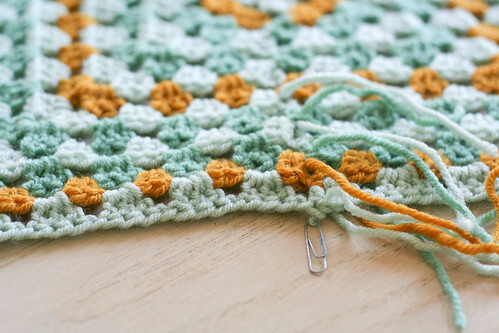 So, as I continued to ignore that box o' granny squares…I felt the need to start another project. I had three colors of yarn that I loved together, so I sat down earlier this week and randomly started making this blanket. It's the first time I've switched colors in crochet, so I was ridiculously proud about figuring it out. 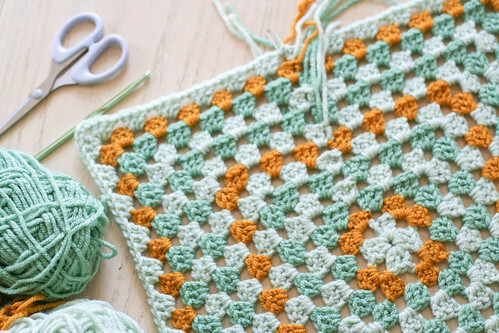 I wish I would have just done the first blanket in this style, which is essentially just one big granny square. Much, much easier (and completely addictive, if I do say so myself). I'm thinking that it may be time to invest in something other than paper clips to hold my spot. Maybe? Maybe. And as a side note, for those of you who want to learn to crochet, do it. I totally recommend it. 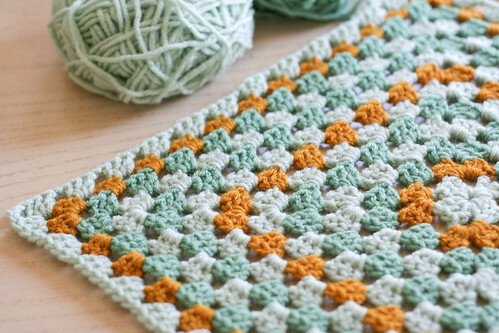 This blanket is being made with only two simple stitches: single crochet and double crochet. You can get crochet hooks and yarn for super-cheap at any craft store (we even have them at our local dollar store), then scour the internet for tutorials to teach yourself! Pinterest, blogs, YouTube, anywhere. I'm a leftie, so it took a bit more time trying to figure it out (most tutorials are for right-handed folks), but if I can do it, so can you. 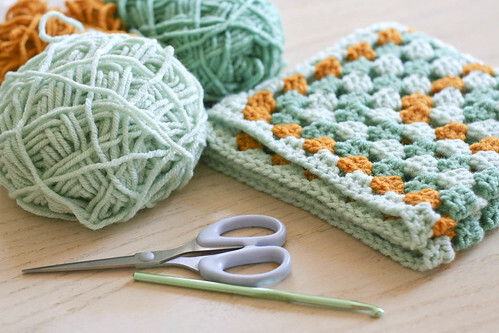 I've checked out a bunch of books on crochet from the library, and that is another way to learn through step-by-step photos and simple projects. I know I've said it before, but there's something about crocheting that is so calming. I like that it's something that I can pick up and work on whenever I have a few minutes to myself, and it gives me such a feeling of accomplishment with only a little effort here and there. Part of me doesn't even mind that this blanket may not be done for a couple weeks…it's nice to always have something I love to work on. I keep looking at this blanket, thinking, How the heck did I make this with yarn and a hook? Mind blown. There's something to be said for handicrafts. So satisfying. And when you're working on something like this, it's like a tiny little escape. so pretty!!! i wonder when i'll have time to crochet/knit again! I agree, very pretty. The color combination is fantastic! Looking forward to seeing the finished project. I love love loooove this color combo! 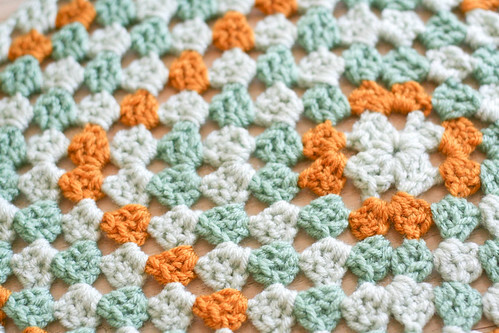 I've been meaning to make a new crochet blanket but can never figure out a good color combination. You have such a great design sense! I'm curious; I see you start your rounds from the middle of a side as opposed to the corner. Is there any benefit in this method? hoping this is coming too late..I just started crocheting myself and love this blanket! What kind of yarn did you use? I just started crocheting myself and love this blanket. Im hoping to work my way up to one of these. What kind of yarn did you use?